With its deluge of detail matched by its abundance of fuzzy charm, Zootropolis (known as Zootopia in the US) is a beautiful example of how to create fun-for-all-the-family entertainment. Although it’s the latest from the legendary Walt Disney Animation Studios, they’ve been thinking out of the box recently with films like Wreck–It Ralph and Big Hero 6 and this too has a modern, ambitious flavour, while revisiting the fully anthropomorphised animals of Robin Hood et al. Directed by Byron Howard and Rich Moore and co-directed by Jared Bush (who co-wrote the screenplay with Phil Johnston), it’s the gorgeously animated story of trailblazing bunny Judy Hopps (voiced by Ginnifer Goodwin), fetchingly described by Moore as ‘Pollyanna mixed with Furiosa’. Judy leaves the family carrot farm, and her 275 brothers and sisters, to enlist as a police officer in the eponymous urban jungle, the first of her kind to do so. Initially she encounters resistance from the enormous predators on her inner-city squad, not least Chief Bogo (Idris Elba) who dismisses her achievements at the academy and makes her a traffic cop. When she teams up with con-artist fox Nick Wilde (the wonderful Jason Bateman) on the trail of a missing otter, Judy gets a chance to prove her worth and is forced to confront her prejudices. 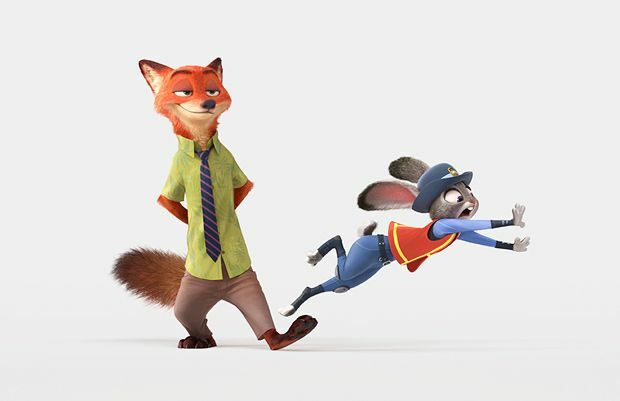 An admirable attempt to nab back the animation crown from baby sister Pixar, Zootropolis has so much going on it could be slowly savoured frame by frame (the co-existence of enormous and tiny animals inspires imagination aplenty, and there’s immaculate character design and fur you’ll want to reach out and touch) – but instead it flies by. The be-true-to-yourself and don’t-judge-others messages are nicely worked in: while it’s robustly right-on, including being cheerfully feminist, it never feels preachy. The classy, edgy cast (which also includes JK Simmons and comedian Jenny Slate) will be appreciated by more mature audiences, as will the references, which include nods to Breaking Bad, Seven and, most fruitfully, The Godfather. Shakira’s bland musical contribution brings things to an unwelcomely generic conclusion but it’s a rare misstep in a film that’s overflowing with ideas. Trailblazing rabbit Judy (Goodwin) goes to the city to join the police, and teams up with con artist fox Nick (Bateman) on the trail of a missing otter. Cheerfully feminist but never preachy, with gorgeous animation and a classy cast, it's a model piece of family entertainment.